Epiphany was already awesome before, but it just keeps getting better. Let’s look at some of the most-noticeable new features in Epiphany 3.24. 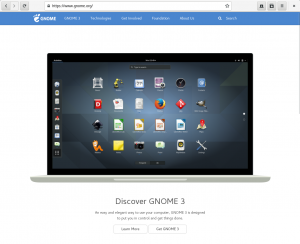 Discover GNOME 3! Discover the address bar! You Can Set a Homepage! A very small subset of users have complained that Epiphany did not allow setting a homepage, something we removed several years back since it felt pretty outdated. While I’m confident that not many people want this, there’s not really any good reason not to allow it — it’s not like it’s a huge amount of code to maintain or anything — so you can now set a homepage in the preferences dialog, thanks to some work by Carlos García Campos and myself. Retro! Carlos has even added a home icon to the header bar, which appears when you have a homepage set. I honestly still don’t understand why having a homepage is useful, but I hope this allows a wider audience to enjoy Epiphany. 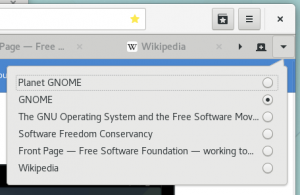 Firefox has an equivalent feature, but Chrome does not. Ours is not perfect, since unfortunately the menu is not scrollable, so it still fails if there is a sufficiently-huge number of tabs. (This is actually surprisingly-difficult to fix while keeping the menu a popover, so I’m considering switching it to a traditional non-popover menu as a workaround. Help welcome.) But it works great up until the point where the popover is too big to fit on your monitor. Note that the New Tab button has been moved to the right side of the header bar when there is only one tab open, so it has less distance to travel to appear in the tab bar when there are multiple open tabs. I modified our adblocker — which has been enabled by default for years — to subscribe to the EasyPrivacy filters provided by EasyList. You can disable it in preferences if you need to, but I haven’t noticed any problems caused by it, so it’s enabled by default, not just in incognito mode. The goal is to compete with Firefox’s Disconnect feature. How well does it work compared to Disconnect? I have no clue! But EasyPrivacy felt like the natural solution, since we already have an adblocker that supports EasyList filters. Disclaimer: tracking protection on the Web is probably a losing battle, and you absolutely must use the Tor Browser Bundle if you really need anonymity. 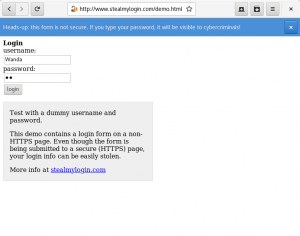 (And no, configuring Epiphany to use Tor is not clever, it’s very dumb.) But EasyPrivacy will at least make life harder for trackers. I had a hard time selecting the text to use for the warning. I wanted to convey the near-certainty that the insecure communication is being intercepted, but I wound up using the word “cybercriminal” when it’s probably more likely that your password is being gobbled up by various governments. Feel free to suggest changes for 3.26 in the comments. Cedric Le Moigne spent a huge amount of time gutting our smart bookmarks code — which allowed adding custom search engines to the address bar dropdown in a convoluted manner that involved creating a bookmark and manually adding %s into its URL — and replacing it with an actual real search engine manager that’s much nicer than trying to add a search engine via bookmarks. Even better, you no longer have to drop down to the command line in order to change the default search engine to something other than DuckDuckGo, Google, or Bing. Yay! Jakub Steiner and Lapo Calamandrei created a great new high-resolution app icon for Epiphany, which makes its debut in 3.24. Take a look. Carlos García added a new ephemeral mode API to WebKitGTK+, and modified Epiphany to use it in order to make incognito mode much more stable and robust, avoiding corner cases where your browsing data could be leaked on disk. Carlos García also added a new website data API to WebKitGTK+, and modified Epiphany to use it in the clear data dialog and cookies dialog. There are no user-visible changes in the cookies dialog, but the clear data dialog now exposes HTTP disk cache, HTML local storage, WebSQL, IndexedDB, and offline web application cache. In particular, local storage and the two databases can be thought of as “supercookies”: methods of storing arbitrary data on your computer for tracking purposes, which persist even when you clear your cookies. Unfortunately it’s still not possible to protect against this tracking, but at least you can view and delete it all now, which is not possible in Chrome or Firefox. Sergio Villar Senin added new API to WebKitGTK+ to improve form detection, and modified Epiphany to use it so that it can now remember passwords on more websites. There’s still room for improvement here, but it’s a big step forward. I added new API to WebKitGTK+ to improve how we handle giving websites permission to display notifications, and hooked it up in Epiphany. This fixes notification requests appearing inappropriately on websites like the https://riot.im/app/. Notice the pattern? When there’s something we need to do in Epiphany that requires changes in WebKit, we make it happen. This is a lot more work, but it’s better for both Epiphany and WebKit in the long run. 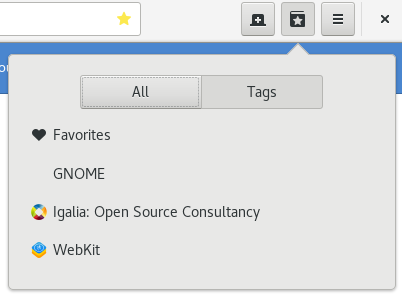 Read more about WebKitGTK+ 2.16 on Carlos García’s blog. Unfortunately, a couple exciting Epiphany features we were working on did not make the cut for Epiphany 3.24. The first is Firefox Sync support. This was developed by Gabriel Ivașcu during his Google Summer of Code project last year, and it’s working fairly well, but there are still a few problems. First, our current Firefox Sync code is only able to sync bookmarks, but we really want it to sync much more before releasing the feature: history and open tabs at the least. Also, although it uses Mozilla’s sync server (please thank Mozilla for their quite liberal terms of service allowing this! ), it’s not actually compatible with Firefox. You can sync your Epiphany bookmarks between different Epiphany browser instances using your Firefox account, which is great, but we expect users will be quite confused that they do not sync with your Firefox bookmarks, which are stored separately. 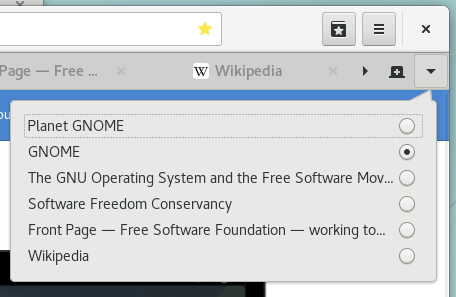 Some things, like preferences, will never be possible to sync with Firefox, but we can surely share bookmarks. Gabriel is currently working to address these issues while participating in the Igalia Coding Experience program, and we’re hopeful that sync support will be ready for prime time in Epiphany 3.26. 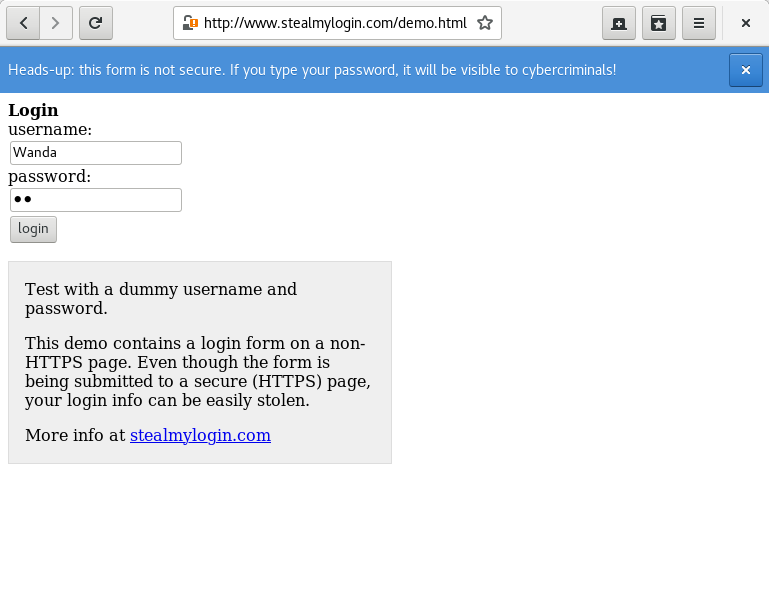 Also missing is HTTPS Everywhere support. It’s mostly working properly, thanks to lots of hard work from Daniel Brendle (grindhold) who created the libhttpseverywhere library we use, but it breaks a few websites and is not really robust yet, so we need more time to get this properly integrated into Epiphany. The goal is to make sure outdated HTTPS Everywhere rulesets do not break websites by falling back automatically to use of plain, insecure HTTP when a load fails. This will be much less secure than upstream HTTPS Everywhere, but websites that care about security ought to be redirecting users to HTTPS automatically (and also enabling HSTS). Our use of HTTPS Everywhere will just be to gain a quick layer of protection against passive attackers. Otherwise, we would not be able to enable it by default, since the HTTPS Everywhere rulesets are just not reliable enough. Expect HTTPS Everywhere to land for Epiphany 3.26. Are you a computer programmer? Found something less-than-perfect about Epiphany? We’re open for contributions, and would really appreciate it if you would try to fix that bug or add that feature instead of slinking back to using a less-awesome web browser. One frequently-requested feature is support for extensions. This is probably not going to happen anytime soon — we’d like to support WebExtensions, but that would be a huge effort — but if there’s some extension you miss from a sadder browser, ask if we’d allow building it into Epiphany as a regular feature. Replacements for popular extensions like NoScript and Greasemonkey would certainly be welcome. Not a computer programmer? 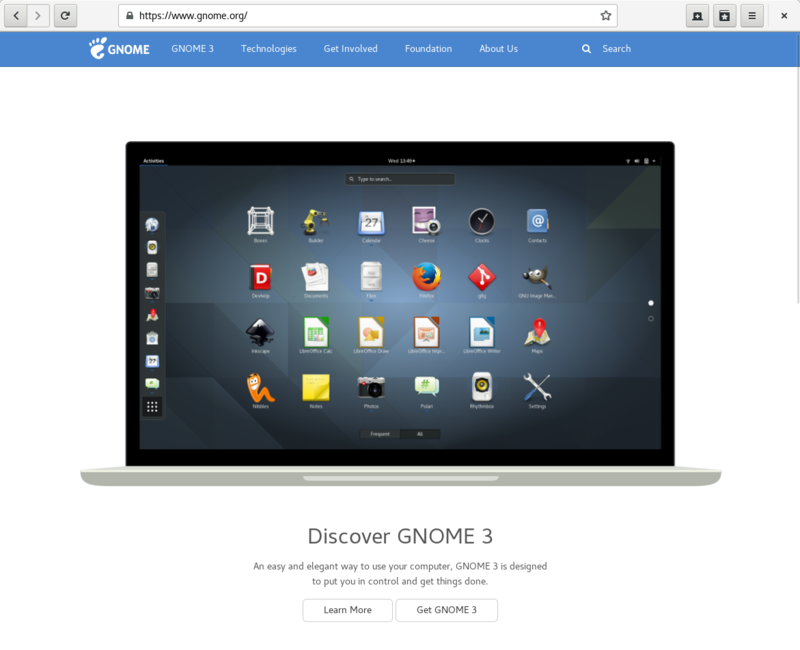 You can still help by reporting bugs on GNOME Bugzilla. If you have a crash to report, learn how to generate a good-quality stack trace so that we can try to fix it. I’ve credited many programmers for their work on Epiphany 3.24 up above, but programming work only gets us so far if we don’t know about bugs. I want to give a shout-out here to Hussam Al-Tayeb, who regularly built the latest code over the course of the 3.24 development cycle and found lots of problems for us to fix. This release would be much less awesome if not for his testing. OK, I’m done typing stuff now. Onwards to 3.26!